Were things really better “back in the old days?” Whether you’re talking about music, politics, movies, or your ability to sleep with your doors unlocked, nostalgia is invariably a force to be reckoned with. Everyone loves to pine for days gone by, but few do it with the enthusiasm of the whiskey fanatic. It’s natural to be wistful for one’s youth, and in the whiskey world this has led to a strange phenomenon: The search for “dusties,” old bottles of (usually) everyday spirits that can be found haunting the forgotten corners of liquor store shelves, damp cellars, and grandpa’s attic. They’re called dusties for an obvious reason: When you find a 40+ year old bottle of booze, it’s invariably caked in the stuff. Dusties often find their way to the auction market. A bottle of booze that cost $5 in 1975 can fetch $60 to $80 at auction today, or even more. Older stuff gets progressively more expensive; if you have something dating back to pre-Prohibition days, you can expect a rich price tag indeed. The obvious next question is why? Why do people today care about bottles of booze their parents didn’t even think was good enough to open? Because, the theory goes, it’s better. And even if it’s not, it’s a peek at the past, a look at how they made whiskey before the boom struck, and everything went corporate. There’s some truth to this. Bourbon sales were at an all-time low in the 1970s and 1980s, although overall production was surprisingly about the same then as it was today. (The all-time record for the most barrels filled still belongs to 1967.) That means that back in the 1970s there was plenty of bourbon sitting in barrels, because no one was in a rush to buy it, so the average bottle of bourbon released to the market was likely considerably older than it is today. None of this is well noted or easily proven, of course, because age statements were as randomly applied in the ’70s as they are today. Of course, there’s also an argument to be made that whiskey made 40 years ago was more “craft” in nature, with fewer robots and computers in the mix. (Whether that is a good thing or a bad thing remains an open debate.) In any case: Old whiskey is almost assuredly different than today’s whiskey. Dusties have another key appeal that makes them especially enticing: While whiskey doesn’t improve or really change once it’s in the bottle, it doesn’t go bad, either. That’s a key advantage over picking up a bottle of 40 year old wine, which could be delightful today but which is more likely to have turned to vinegar. The trick is finding them. Dusty hunters have long since scoured every corner of every liquor store in the world, leaving them to hunt at estate sales and pay increasingly hefty prices at public auctions for the stuff. That has in turn invited counterfeiting into the market: Just fill an old bottle with new hooch, recreate a tax stamp, and wait for the money to roll in. I had the good fortune of having a friend who was sitting on several boxes of dusties, comprising a wide range of bourbons, Scotch, and Canadian whiskeys, all bottled sometime in the 1970s. These had been inherited by a relative — a trash collector who, as was the custom of the time, received a bottle of booze on Christmas each year as a tip for his service, the bottle placed on top of the trash can, of course. Not a huge drinker, dozens of these bottles went into storage and whiled away in a basement until they finally emerged down the street from a huge booze nerd (that is, me). Said friend recently gifted me two of these bottles — an Ancient Age and a Jim Beam White Label, still in their gift boxes — and I wasted little time in opening them up to sample. What was I drinking, exactly? Dating a dusty isn’t easy. While there are clues in labels and on the bottle itself, it can be awfully difficult to determine with accuracy how old a bottle of whiskey actually is. I put the question of age to the distilleries themselves. Buffalo Trace, which makes Ancient Age, even has an archivist on staff, and she would know better than anyone. Unfortunately, the bottle markings were no help; the tax stamp was the only key to the age of this whiskey, which dated it to anywhere between 1961 and 1977. My hunch is that the whiskey dates to the last few years of this range, based on the circumstances outlined by a friend. I had much better luck at Beam. They ran photos of my bottle all the way up to master distiller Fred Noe. His educated guess (largely thanks to a bottle marking on the bottom of the container) is that it was bottled in 1976. As part of my comparison, I asked each distillery for a new release of each whiskey, in order to compare them side by side to see what changes have taken place in the last 42 years or so. Again, it’s tough to say much about the actual production of the dusties, or even the new releases. 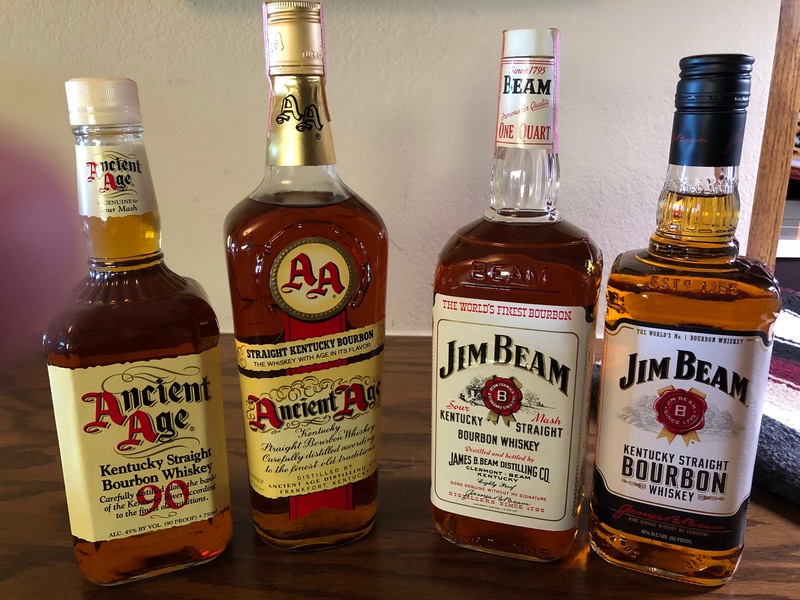 Of the four bottlings, only the new Jim Beam has any kind of age statement, noting that it is 4 years old in the fine print on the side of the bottle. Also, remember that all of these are “cheap” bourbons. Though the inflationary hierarchy we have today wasn’t even close to being in effect at the time, the dusties would have still been considered fairly bottom shelf offerings back in the 1970s. So, let’s start things off with Ancient Age. Here, the difference was even more striking, and the tasting notes speak for themselves.